How to calculate the mechanical advantage? 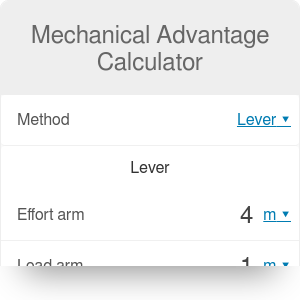 If you ever wondered how a lever, a pulley, or perhaps a wedge makes or life easier, you've come to the right place: this mechanical advantage calculator will tell you by what factor do these simple machines amplify the force. This article will explain to you how to calculate the mechanical advantage of a lever, pulley, screw, wedge, ramp (inclined plane), and wheel and axle - six simple machines - and provide you with a mechanical advantage formula for each of them. Simple machines are six basic mechanical devices defined by Renaissance scientists. In essence, they are elementary mechanisms that amplify the force you use to move objects. For example, a lever multiplies the force with which you push one of its ends to lift the other (loaded) end. Many other, more complicated machines are created by putting together these simplest 'building blocks'. Each of the simple machines takes advantage of the fact that work is equal to force multiplied by the distance. Each device increases the output force at the cost of decreasing the distance traveled by the load. This way, the work done by the load stays equal to the work done by the force you've applied. If you open the advanced mode of this mechanical advantage calculator, you will be able to determine the output or input force for each of the six simple machines. In the text below, you will find the formulas that will allow you to establish the mechanical advantage of each of these machines basing solely on their geometry. Motion - the direction of motion after the force has been applied. 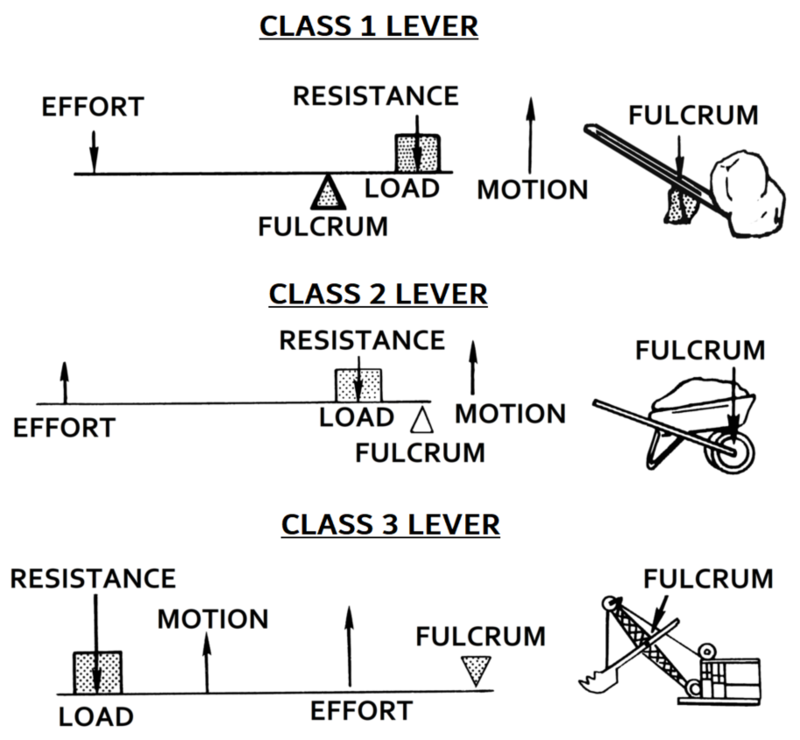 load arm is the distance between the point of resistance and the fulcrum. As visible in the figure above, a pulley is a system made of wheels and ropes that connect them. Two wheels make one pulley. where n is the number of pulleys in the system. If you were looking for a system of two wheels of different diameters connected with a belt loop, you should head straight to our pulley calculator. Lead of the thread. In simple screws, the lead is equal to the distance between two adjacent threads. 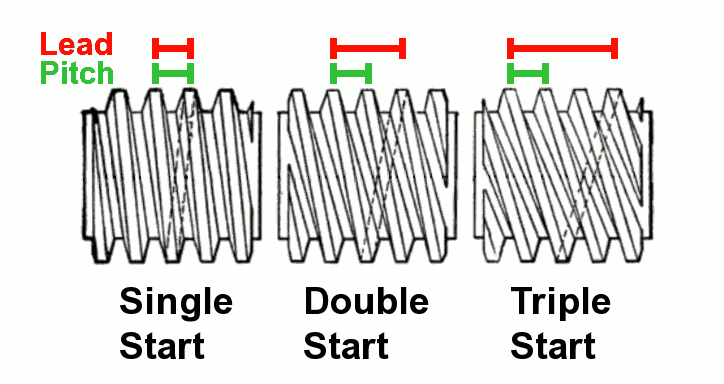 In double- or triple-start screws, it is defined as the distance (parallel to the screw's axis) the screw travels in one complete revolution of the shaft. Length is measured in the vertical direction (see the picture above). A ramp, otherwise known as an inclined plane, is a flat surface tilted at an angle to the horizontal. It is similar in shape to a wedge - in fact, a wedge in nothing but a portable inclined plane. Also, a screw is essentially an inclined plane wrapped around a cylinder. If you analyze these equations more closely, you will find that they are equivalent, as sin Θ = V / L.
As the name suggests, a wheel and axle is a machine consisting of two parts: a wheel (the green part in the picture above) and an axle (the yellow part). These two elements rotate together, and the force is transferred between them. If you apply a small force to the wheel on the outside of the machine, it will be transferred to the smaller axle and amplified. If you don't know the radius of one of the elements, but you know its circumference, head straight to our circumference calculator to determine the radius without tedious hand calculations. Mechanical Advantage Calculator can be embedded on your website to enrich the content you wrote and make it easier for your visitors to understand your message.